On November 7 we will host a talk by Michael Molloy on his recently launched book, Running on Empty. The discussion is hosted in partnership with ARCM Thailand and the Canadian Embassy, with Professor Vitit Muntarbhorn and Professor Supang Chantavanich as discussants. 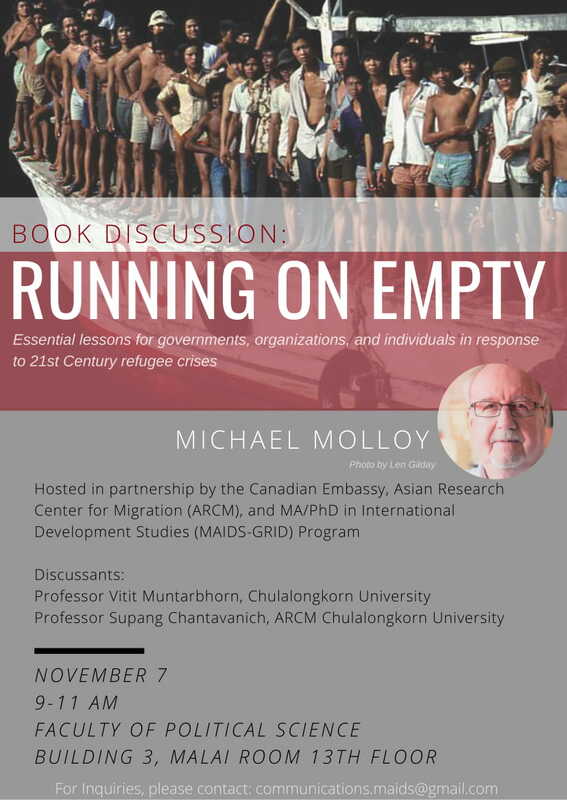 Michael Molloy is an honorary senior fellow at the Graduate School of Public and International Affairs at the University of Ottawa, a former Canadian Ambassador to Thailand, and was a senior coordinator of the Indochinese Refugee Task Force from 1979 to 1980. Running on Empty presents the challenges and successes of the Canadian refugee resettlement effort following the 1975 fall of Saigon. This led to the 1976 Immigration Act, establishing new refugee procedures and introducing private refugee sponsorship which in 1979 saw the intake of an unprecedented 60,000 refugees. Running on Empty offers essential lessons for governments, organizations, and individuals trying to come to grips with refugee crises in the 21st century.